Here's an interesting and reasonably scarce book I've just bought on ebay for a few pounds. It's Lüchow's German Cookbook, written by Jan Mitchell, and first published in 1955. Actually, this is the first British Edition, and the first American edition was published a few years earlier. "Lüchow's was a restaurant in New York City formerly located at 110-112 East 14th Street, with the property running clear through the block to 13th street. It was founded in 1882 when a waiter, August Lüchow, purchased the German restaurant and beer garden he had been working at, and remained in operation for a full century, closing in 1982 after a suspicious fire gutted the building. The decor included over sixty paintings, many by well-known artists such as Francisco Goya, Anthony Van Dyck, Van Mienis, Snydes and Sweden's August Haagborg. The Haagborg was purchased by Lüchow at the 1904 St Louis World Fair. There was also a collection of over two hundred beer steins, and a number of mounted hunting trophies made from animals shot by Lüchow. In 1957, the restaurant included seven dining rooms, among them the Hunting Room, which contained the trophies, and the Niebelungen Room, decorated with murals based on Richard Wagner's Ring Cycle operas." I was amused to see that none other than the great Marlene Dietrich was a regular patronne (of course she was! 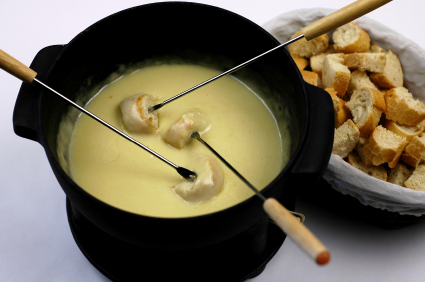 ), and that her favourite dish was Vienna Backhaänderl, with which she drank Moselle (of course she did!). Those were the days. How refreshing to be able to stroll into your local German restaurant, sit underneath a Goya say, or a Van Dyck and order a Schnitzel Hostein, washed down with an excellent sweetish Hock. Rinse chickens; drain. Cut each in half, pat dry. Sprinkle with salt. Roll each piece in flour. Dip in egg, then in crumbs. Fry in hot fat, lowering each piece carefully into fat to avoid shaking crumbs off. When golden brown, place in baking pan, and bake in hot oven (400℉) until well browned. Lower heat to 325℉ after crust is firm, and continue baking until done; about 40 minutes in all. Place on thick paper towelling in a pan; set in oven, but leave oven door open. Season lightly with salt. Garnish with lemon, and serve on warmed dish. Serves 6. Baden-Baden turned out to be a German version of Bath, or Cheltenham- an elegant, monied kinda town, where the Herrenvolk go on holiday to have sterilised mineral waters (and other similar delights) shot up their backsides. I liked the place. In such a refined environment, we were expecting lighter foods: carrot juices, infusions, Ryvita bread- that sort of thing. The reality was entirely different. First stop was at a Lowenbrau biergarten. Here, burly waiters in Lederhosen brought vast plates of sauerkraut, sausages, pasta (schupfnudein), pork knuckle, bread dumplings (knodel) and the like. Judging by the Gothic proportions of most of our fellow diners' stomachs (their toes must be a distant memory), helpings of this enormity are probably de rigeur in the Fatherland. I ordered a beer. This arrived in a flagon about three feet high (I kid thee not) and I could barely lift the blasted thing off the table. For breakfast we had hearty heaps of bratwurst, smoked salmon, goat's cheese, black pudding, smoked meats and black bread. It's not that the food is particularly bad in Germany; it's not. It's just that after a few days of knodel, Black Forest Gateau, stomach slapping and beer burping, you start to dream longingly of the lighter and more refined food cooked by the French. Heidelberg had a grungier atmosphere to Baden-Baden and is bathed in a rather beautiful, glowing, reddish light. A distinguished university town, it was one one of the few German cities to have survived intact after the Second World War. It's also home to the slightly sinister duelling fraternities, for which I have a burgeoning fascination. The students still wear the uniform of cap, breeches, and coloured sash. 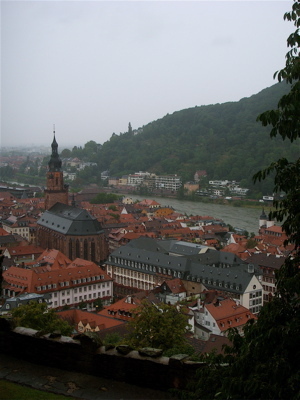 The town is overlooked by the ruins of Heidelberg Castle. 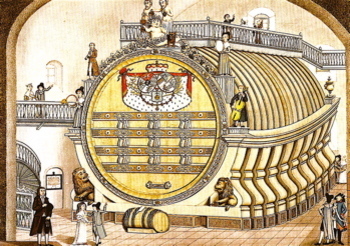 In the cellars is the enormous 18th century tun- or vast barrel (Das Grosse Fass) constructed by the Prince Elector Karl Theodor to hold fifty-eight thousand gallons of wine. The tun was looked after by one lucky Tyrolean midget called Perkeo. Next stop was the spooky Chateau de Jaulny in Lorraine. This unfashionable part of North Eastern France is remote, and off the tourist track- which being an admitted "contrarian" was one of the reasons for going there in the first place. The countryside is beautiful, if slightly desolate, and relatively unpopulated; with the lovely, fast, empty French roads surrounded by deep, dark forests, and undulating hills. Perfect werewolf country. Jaulny stands silhouetted on a ridge and has a whiff of Transylvania about it. 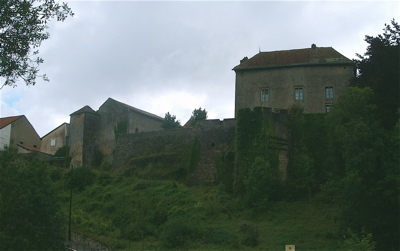 The chateau may have once been the residence of Joan of Arc. Madame was charming, and explained that the stuffed wolf's head mounted on the stone wall in the Hall (which would have done Hammer proud) had been shot by one her ancestors at beginning of the last century. Wolves, apparently have now been re-introduced into France, and are now making their way back to Lorraine. After two unsettling nights (is Jaulny haunted? ), we crossed the Vosges mountains into Alsace. 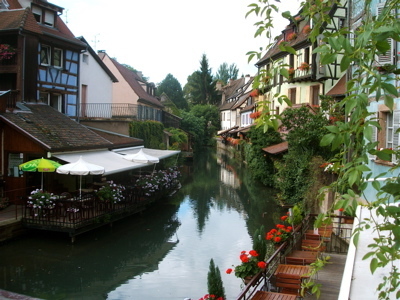 Alsace is a fascinating part of France. Until the end of the First World War it was part of Germany, though today it is a curious hybrid- the look is decidedly German, though the feel of the place is French. As soon as you leave Lorraine, things start getting Germanic: chalets appear; churches start aquiring onion domes, you start to get towns ending in "burg", and "heim"; supermarkets sell canned goat cheese terrine, the hills are alive with the sound of. And this applies to the food, too. If you're going to enjoy Alsatian food, the charming town of Colmar is probably a good place to do it. Colmar is a Medieval huddle of half-timbered and shuttered houses, cobbled streets, winstraubs and tasty, buxom waitresses in the traditional dirnl. Lots of gingerbread, too. One of the most delicious Alsatian specialities is the tarte aux flambee. This is similar to pizza, but has a thinner, more delicate crust. The traditional tarte has onion and smoked pork; though in a smallish restaurant opposite the kofihaus, The Girl had a superb asperges blanc tarte, washed down with a carafe of the excellent Alsatian wine. 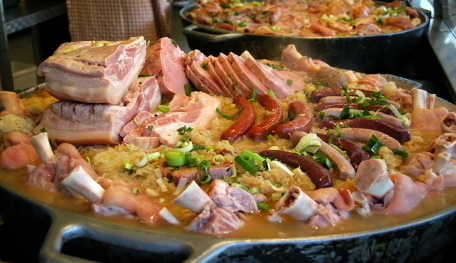 Another Alsatian dish is sauerkraut, or charcoute. 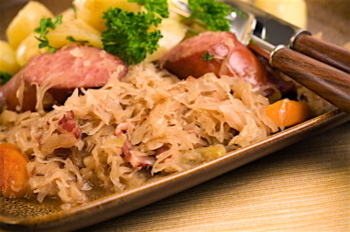 Pickled cabbage is stewed gently for three hours, often with a splash of Reisling at the end of the cooking period, and then served with sausages, bacon, and smoked pork. Before we left Colmar for The Fatherland itself, I had another chance to sample the delights of the tete de veau. Well, I had to, didn't I? This one was well-prepared, with the chunks of pink coloured simmered meat (and the accompanying gobbets of brains and fat) arranged in an earthenware pot. With the viniagrette came a mayonnaise and caper sauce. 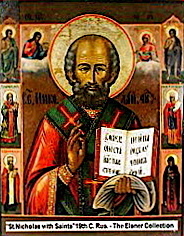 Today is the Feast of St. Nicholas. Father Christmas, or Santa Claus, is partly derived from this saint. In Holland and other parts of Europe, children put out a boot for Saint Nick on the night of the 5th December to get presents. St. Nicholas has, I think, a creepy assistant called "Black Peter" who gives naughty kiddiwinks a lump of coal. For me, the run-up to Christmas really starts about now. I was in a Black Cab with a friend a few nights ago, and as we sped through Sloane Square on the way back to the mean streets of Battersea, the Christmas lights looked fantastic. Bond Street is also currently looking pretty amazing. 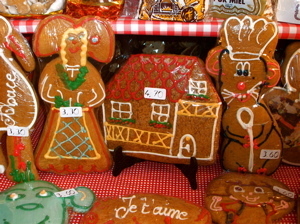 Anyway, as I'm now in that sort of mood, I thought it might be a good plan to have a look at Gingerbread. As a ginger fanatic, I can't get enough of the stuff. Here is a recipe to make Gingerbread Men (I'm rebelling against the latest politically correct trend to call them Gingerbread People. The world is mad enough as it is). I've adapted this recipe from the internet. 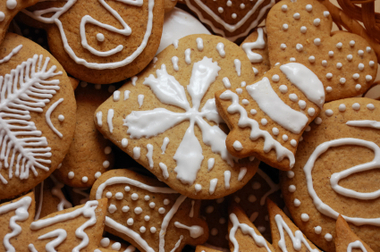 First you need to pre-heat your oven to 170 C. Line a baking tray with baking parchment to stop the Gingerbread sticking. Melt 125g of unsalted butter, 100g dark muscavado sugar, and 4 tablespoons of golden syrup (that's the stuff in those picturesque old-fashioned tins). Sieve 325g flour, a teaspoon of bicarbonate of soda, and two teaspoons of ground ginger into a bowl, and then stir in the melted ingredientsto form a dough. Use your hands! Turn the dough out on to a lightly floured board, and using a rolling pin, roll it out to a reasonable thickeness. I like them quite thick. Now for the fun bit. You can use a Gingerbread Man cutter thing (available from cookshops) to make Gingerbread Men, or if you prefer other shapes, you can make stars, and biscuits, and goodies like that. Place them on the tray, shove in the oven, and cook them for about nine to ten minutes. When they're cooked properly, you can decorate them with icing. Frankly, I can't be bothered, and they're long gone before then. Patience is a virtue- and it ain't found in me.